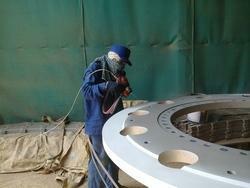 Being a market leader of this domain, we present patrons with the finest quality of Sand Blasting Services. Used for sand blasting hoppers and sand blasting hoses, the sand blasting services are appreciated for their execution with promised time frame. Based on the specifications provided, the sand blasting services, which are highly effective for liquid jets, can be customized. Metalizing Services is used extensively for the corrosion protection of steel and iron in wide range of environments and has been shown to afford very long term protection in both marine and industrial locations. The life of the metal coating is proportional to the coating thickness. It is possible to increase the thickness to obtain enhanced corrosion protection. 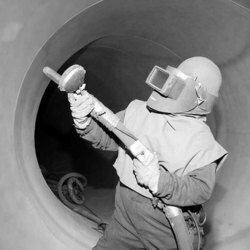 Zinc spray (galvanizing) coating can be applied in thickness from 50 microns to over 500 microns.Spray galvanizing is long term protection in industrial environments, coastal, offshore environments and high humidity atmospheres. The galvanizing coatings are effective for protecting mild, low alloy and high carbon steels. Steel can be protected by spray galvanizing followed by the one or two coat of epoxy painting can withstand aggressive environments like salt spray condition for long periods. Looking for Sand Blasting Services ?